If you have thought about moving your house, there are many things to consider and plan for. The choice to move a home (whether from a flood prone area like our coastal areas in near Mystic, Narragansett, or Westport or because you have a better location for a building that you love) is a process that can take nine months to a year to complete. Basically, you can’t wake up on a Monday, decide that it’s time to move the structure, and have it done by Saturday. This is not a job for amateurs. We’ve heard of people trying to use car jacks to lift their house. This is extremely dangerous. Lifting and moving houses is dangerous and precision work that should be left to the professionals. Our service area emcompasses Providence, Warwick, Cranston, Stonington, New Haven, Mystic, Westport, Worcester, Springfield, Lowell and other towns across Rhode Island, Massachusetts, Connecticut so we are here to help you wherever you are located. In order to make this process easier for you, we’ve compiled a list of things to consider and plan for when you are making to make the big move and some pictures from a move that we did in Lebanon, CT. Neighbors may need to sign off on your house move. Research any rules or bylaws in your HomeOwner’s Association to learn to see if a move can even be done. Many towns may also have a height limit or a water requirement. You will need to have a set of moving and engineering plans for the permitting process. Gas and utility companies will need to be contacted as these utilities will need to be shut off. Plan to move everything such as valuables and irreplaceable items out of the home before it is lifted or moved. Some people have found damage to items that they have left. Chimneys can be moved along with the house depending on the size of the road and if the chimney will make the structure too tall and cause a hazard to wires that are over the road. The foundation must be fixed and the installer will need to backfill before the house is placed. Consider this when planning what needs to be done before the house starts to roll. Below, here is a look at the process that Eastman Building Movers followed moving the structure in Lebanon, CT. We were featured by the newspaper The Chronicle These scans are from that article.In the first picture below, the historic William Beaumont House in Lebanon makes its way to the other side of the green in Lebanon CT. 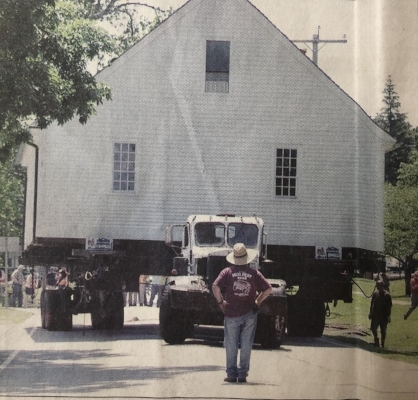 The Lebanon Historical Society moved the Cape-Cod style house to the historical society’s museum. In the next picture, the metal grates that are shown act as grips to give the truck traction underneath the house. Underneath that, spectators line along the green to watch the move. People love to watch the houses being moved. Also, the cables that are used to hold the house and slow it down so that it doesn’t slide or move ahead of the transport vehicle are seen in the photos. Eastman Building Movers will be happy to discuss more about the process of building moving with you if you have questions. We move homes in Massachusetts, Rhode Island, and Connecticut. Call Ray at 401-885-4216 or email us at info@eastmanbuildingmovers.com.